The brick mortar joint is the juncture of two or more masonry pieces that leaves a space among the bricks or concrete masonry units which are filled with mortar or a grout mixture. If the joint remains parallel to the bed of masonry pieces in a course, it is known as bed joint. If the joint is perpendicular, then the bed joints are known as vertical joints, side joints, head joints, or just joints. The mortar joint can make the building watertight as well as keep the structural integrity of free standing walls. The following types of mortar joints are generally utilized in brick masonry construction. 1. Struck Mortar Joint: This type of mortar joint should not be utilized for outside masonry wall joints because of water leakage problem from the lower edges. Under this joint, mortar is recessed at the bottom by a trowel. The top edge of the joint is completed flat with the brick edge. The slope given in this joint will pull the water as well as retain the water in the brick. So, it will be better to use this joint for the interior walls. 2. Concave Mortar Joint: It is also known as bucket handle joint. This joint is developed with a jointing tool of half circular shape. It is globally recognized as its strong resistance strength against water penetration and firm sealing property. 3. Weathered Mortar Joint: The weathered joint is most recommended for horizontal joints. It has similarity with struck joint but the top edge is recessed rather than the bottom edge of the joint. The resistance strength against water is strong because of its slope. This joint will allow the water spread from the joint. But, if the mortar in the joint is not adhered perfectly with the brick, the water can penetrate through the undersurface of the joint. It leads to shrinkage cracks along the bond line. 4. Raked Mortar Joint: Raked joint is not suitable for outside wall construction since the mortar is minimally recessed from the edge of the brick. ledge that is formed in the joint, which lets the snow, ice or water to stay on the top of the brick. The surface of the joint is generally kept roughened. But, it is possible to compact the surface to raise the water resistance strength. It’s not suitable for modern building because of its weak water resistance strength. It is best suited for interior walls. 5. V-Joint: Because of its “V” shape it’s known as “V” joint. The v-joint can’t offer penetration protection owning to its geometry. The v-joints in brick masonry construction should be compressed perfectly in order that no water is stored inside the groove produced. 6. 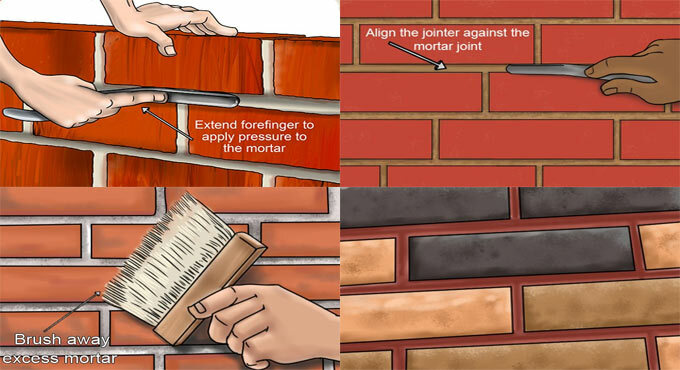 Flush Mortar Joint: The Flush joints are applied in brick wall construction, when the plastering and final finishing should be done on the surface. In this way the flush joints are concealed. If the flush joints are formed in such a manner that it stands out of the brick, the water may accumulate on its top. Here, the mortar is not compressed into the joint, as a result, it becomes critical to retain a firm bond with the brick. 7. Extruded Joint: For this type of joint, there is no requirement of any type of tooling. Here, the extra mortar present in the joint will simply squeeze out and develop an extrusion among the bricks.